I think it’s also important to note that Friedman was all wrong about Japan — and that you can argue that he was also wrong about the Great Depression, for the same reason. For what Friedman argued, both for Japan in the 1990s and America in the 1930s, was that all the central bank needed to do was more — push out those reserves into the banking system. This would raise the money supply, and a higher money supply would have the usual effects. But the Bank of Japan tried that — and found that pushing more reserves into the banks didn’t even lead to rapid growth in the money supply, let alone end the problem of deflation... So, after 2000 the Bank of Japan engineered a huge increase in the monetary base; this was the original quantitative easing. And it didn’t even translate into a surge in the money supply! This is why I’m so skeptical of people who say that all the Fed has to do is target higher nominal GDP growth — in liquidity trap conditions, the Fed doesn’t even control money, so how can you blithely assume that it controls GDP? Again we see that nominal GNP closely tracks the surge in the monetary base. FDR's QE was a smashing success when it came to shoring up aggregate spending. So those of us folks who want the Fed to increase and stabilize nominal GDP have a good reason to believe it is possible--it happened before. (1) QE was tried before in the United States during a liquidity trap and worked incredibly well. (2) QE not only worked well, but it did so in an economic environment far wore than that found in either Japan in the 1990s or the United States today. (3) QE worked because it (i) it reshaped inflation expectations and (ii) was backed up with meaningful increases in the monetary base. The Fed is more than able to do the same today. It certainly can reshape inflation expectations. Just look at what has happened to them over the last month or so when Fed officials started talking up QE2. The Fed would be far more effective, though, at shaping inflation expectations by explicitly committing to some nominal target. Thus, the Fed needs to come out this week with more than an announcement that it is going to purchase say $500 billion assets going forward. It also needs to shake up inflationary expectations and do so in a manner that creates certainty going forward. The Fed, then, needs to (1) announce an explicit nominal target and (2) say it will do whatever is necessary to hit it (i.e. it will buy/sell as many assets as needed). I just hope it is a level target for total current dollar spending. Update I: Josh Hendrickson reminds us that QE seems to be working rather well in the U.K.
Update II: The M2 and monetary base data come from Friedman and Schwartz (1963) while the nominal GNP data come from Balke and Gordon (1986). please correct me if I'm wrong, but what you're suggesting is quite unlike what the Fed is proposing to do, is it not? One actually sees money going into the economy, the other does not. Dr. Beckworth, the conservative think tank Economics21 (Keith Hennessey, Ed Lazear, etc.) has a post up critiquing QE, price level targeting and NGDP targeting given current U.S. national income data. I was wondering if you could address it. Unmooring inflation expectations is a dangerous game and using the “price level” as a target seems especially dangerous now given that most market participants think in terms of changes to prices – inflation and returns on assets. The targeting of nominal GDP could be even more dangerous since it would deemphasize real changes in output in favor of “catch-up” based purely on increases in the price level. I am not sure what you getting at here, but if you mean that QE2 will mean the Fed buying long term treasuries and letting them sit in banks as excess reserves then you have a point. However, based on Fed officials talks and the last FOMC minutes, it is possible they may announce an explicit nominal target. Doing so would go a long ways in shoring up the velocity of money and reducing the excess money demand/liquidity problem. This would get money flowing and into the economy again. Let me take a closer look at the piece, but the excerpt below doesn't make a very coherent statement about NGDP targeting. People are proposing fiscal Austerity which should be massively deflationary. Wouldn't this overwhelm any positive effect that QE2 would have on inflation? How can monetary policy raise inflation "expectations" when fiscal policy is creating deflation in reality? Can monetary policy be effective if fiscal policy is pulling in the wrong direction? Didn't QE just work in the UK? Let's look at now. The gold standard shock of 75 years ago isn't especially relevant. Money supply (billions) increased from 800 to over 2000. M2 (billions)went from about 7800 to 8800. Less than dollar for dollar. And the M1 multiplier is DOA at 0.88. This is awfully weak tea. Why wasn't the BoJ successful? Lack of credibility? The Fed may have plenty of credibility to halt inflation but none to increase it. I doesn't look as if Congress has any hands-on kind of control. They can amend the the Federal Reserve Act at any time. From what I understand about the gold exchange standard, exiting it reshaped inflation expectations BECAUSE it enabled "meaningful increases in the monetary base." 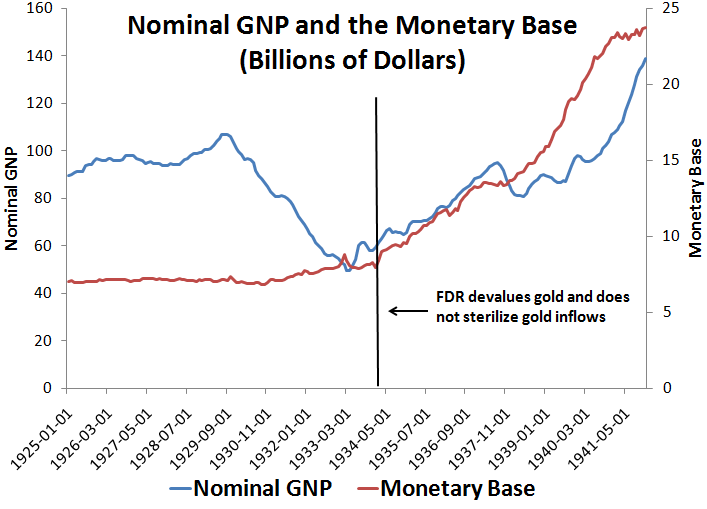 In other words, markets in 1930 saw the monetary base as "fettered" by gold and, as a result of expected gold hoarding, prices collapsed. In 1933, from one day to another, FDR broke this perception. What do markets expect today? There is no perceived exogenous limit on the monetary base. Prices have been rising mildly, not collapsing. If markets expected the zero bound to constrain the Fed, I could see how unconventional policy would have a large impact on expectations. I don't think markets have had that perception since 2008. If anything, markets may have run ahead of the Fed in terms of expectations of QE2 and a level target, and there is a risk of disappointment. The move in the 5yr TIPS spread to 1.7% is welcome, but it still falls short. How does the Fed close the gap to an implied level target? I would argue that if it doesn't close immediately after an announcement, the Fed's credibility would be in question, and the mechanism for rebuilding it (yet more QE?) is not clear. 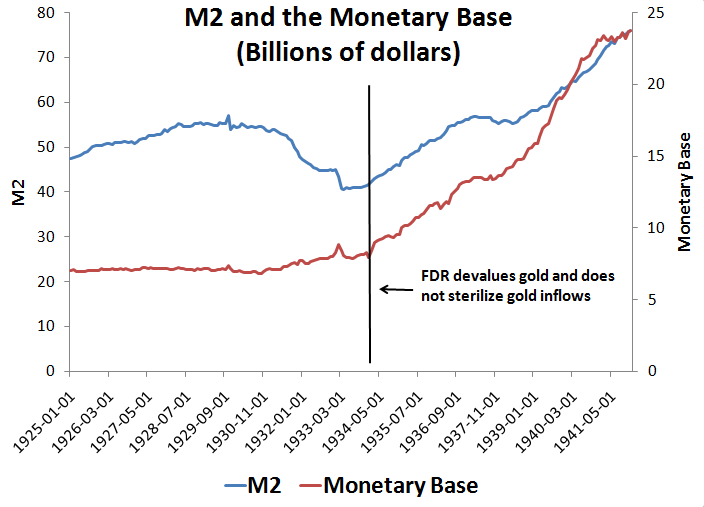 Comparing the increase in the monetary base to M2 during QE1 is misleading. The Fed was not directly trying to stabilize inflation expectations then. Rather it was first and foremost trying to save the financial system. Bernanke himself said we should not call it QE but CE (credit easing). The large increase in the monetary base was a byproduct of the Fed's efforts to save the financial system, not the ultimate objective itself. 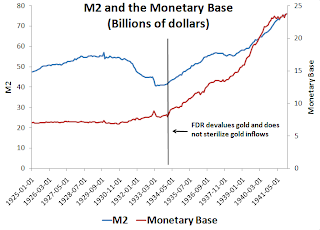 In fact, the Fed chose to manage this byproduct increase in the monetary base by paying interest on excess reserves, a sure way to stall big changes in the money supply. The thinking behind QE2 is far different. Now the Fed wants to directly arrest the decline in inflation expectations and core inflation. This is already happening with inflation expectations. Money supply measures like M2 and MZM are also responding. Stating their nominal goal clearly would make the Fed even more effective. In short, QE1 is a bad comparison because it had a very different objective than QE2. I think the BOJ was very successful because it was credible. Its goal, however, was a flat price level (i.e. 0% inflation). I am hoping Scott Sumner does a post on this again as a reply to Krugman. Good point. I hope Krugman takes notice. Aren't the the Fed QE in the 1930s and the UK QE today really a case of stimulus by devaluation? I imagine that is what Prof Krugman would say in reply, and that is why he is so concerned about China's currency intervention. David, re your response to JzB re QE1/M2 etc....I don't understand what the difference is. QE1 added reserves, just like QE2 is going to do. It doesn't really matter how they added. In fact, if I were to nitpick, I'd say credit easing was better because it actually took dodgy securities off the banks. Saving the system? That's great, but the end result was an increase in reserves by the boatload (no matter what new name the Fed assigns to it). So, if they wanted to free up lending space, then what a terrific way to do it hey?. But we know that reserves are not required by banks in order to lend, so the ultimate response is the same. Pretty much nothing but an indeterminate fall in bond yields of little consequence to borrowers and end users who would rather not borrow it appears. We also know that the link from Base to M2 is not exactly stable, and therefore neither is the link from M2 to GDP, nominal or otherwise. Fair points on the unstable link between base, M2, and nominal income. But during much of QE1 inflation expectations were falling. With QE2 inflation expectations are already taking off (money supply measures M2 and MZM are growing already too). Also the fact that the Fed started paying interest on excess reserves indicates it was not interested in seeing big expansion of the money supply. Again, the Fed this time has been talking up the important of inflation (and thus by implication spending)where as before it was all credit stabilization. They are purposefully communicating a change in inflation expectations this time. That is a very important change. The questions is whether they will follow through. Excuse my ignorance, but in all my reading I still am confused about where the Fed gets what it needs to buy up securities. Does it sell assets from its portfolio, as some are saying it's just an asset swap of short term securities for long, or does it just credit the accounts of sellers? The latter would be the "creating ex nihilo" or printing money meme used by many. Or does it depend on the circumstances? This argument is based on unsound logic. The entire purpose behind QE is to increase lending. Mr. Bernanke has incorrectly diagnosed the current malaise has a banking crisis when it is in fact a household crisis. Mr. Bernanke believes he can make money so cheap that anyone will borrow. The problem is that we have a debt overhang and households are more eager to pay down debt than they are to take on more debt. We see this every quarter in the Z1 data. In saying that QE "worked" in the GD you assert that the US economy experienced a lending boom that resulted in recovery. But no such thing occurred. In fact, lending remained tepid throughout the the 30's and into the 40's. Lending did not boom again until after the war started. This has been evident in Japan and the UK during their QE programs as well. As for the dollar, the argument is the same. QE did not reduce the pound or Yen in Japan and the UK. In fact, both currencies climbed during the program (as did interest rates). Therefore, any economic benefit was not the result of trade benefits. Evidence of QE1 here in the USA tells the same exact story. 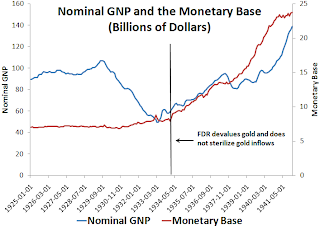 This may have "worked" when we were on the gold standard, but modern evidence shows that QE most certainly does not generate inflation when you're not on a gold standard.